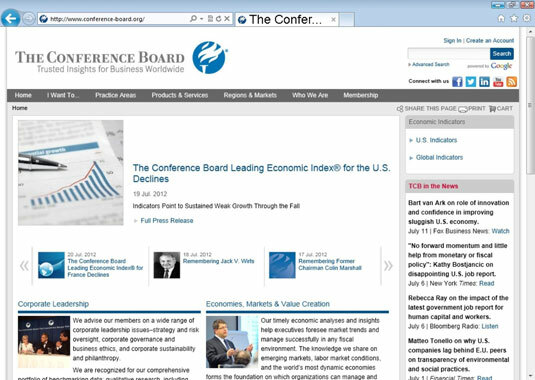 Conference Board: The Big Daddy of economic prognosticators, the Conference Board site measures everything from manufacturing activity to unemployment claims, from building permits to consumer confidence. Pay special attention to the U.S. leading index, which falls when the measures it monitors predict an economic decline. Although the Conference Board’s leading index is widely watched, it’s not always right. Investment pros like to joke that the leading index has predicted six of the last three recessions. For instance, the indicator fell in 1984 and 1987, but the economy didn’t contract either time. U.S. Department of Commerce’s Bureau of Economic Analysis: The Bureau of Economic Analysis monitors how fast the economy is growing, generally the gross domestic product, or GDP. The Federal Reserve Board: Investors look long and hard at the Fed because it sets short-term interest rates, which determine how much money is worth. Don’t confuse short-term interest rates and long-term interest rates. The Fed sets the short-term rates to steer the economy. When the Fed wants to slow the economy, it tightens credit by raising short-term rates, making it more expensive for companies and people to borrow and spend. It can loosen credit by cutting short-term rates, which boosts the economy. Long-term interest rates are set by traders who guess the direction of the economy. The difference between short- and long-term rates is known as the spread. *National Association of Realtors: The National Association of Realtors’ Web site releases closely watched data on both new- and existing-home sales, data that investors can use to get a better sense of the health of the economy as a whole. Yahoo! Finance’s Economic Calendar: Here you can see which reports are coming up each week, what they are, how important they are, and what analysts are expecting. It’s all in one place, too, saving you the trouble of bouncing between all the sites in this list. Economics and Statistics Administration: The Economics and Statistics Administration offers a handy (and free) calendar of important upcoming economic reports. The site also has a free service where alerts of upcoming data releases can be e-mailed to you.